They might be a little late to the party but it seems Canadian governments are finally wading into the growing phenomenon of electronic cigarettes. On Monday, by a vote of 36 to 2, Toronto City Council voted in favour of a Board of Health recommendation which would prohibit e-cigarette use in all City of Toronto workplaces. 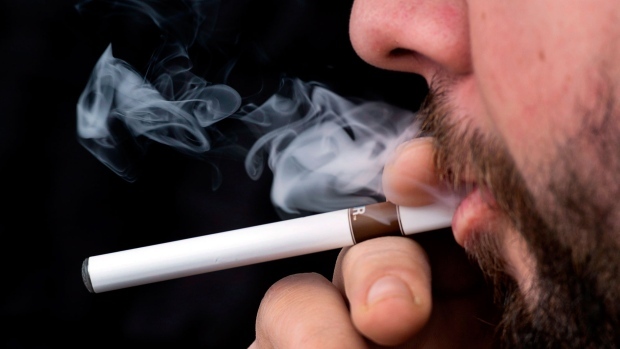 The Board also called on the provincial government to amend the Smoke-Free Ontario Act to ban e-cigarette use wherever cigarettes are banned and to prohibit the sale of e-cigarettes to minors. E-cigarettes are battery operated devices — introduced to North America in 2007 — that mimic the use and taste of conventional cigarettes without the tobacco. The e-ciggy heats up a liquid — usually a mix of water flavouring, proplyene glycol, vegetable glycerine and sometimes nicotine — into a vapor which is then inhaled, or 'vaped' by the user. Advocates of the product claim that they are a useful tool in weaning smokers off traditional cigarettes. But critics — including the Canadian Cancer Society — argue that they can still cause harm, to both smokers and second-hand smokers, and that not enough is being done to regulate them. "Of the 13 products tested, nine were found to have considerable irregularities and only four conformed to their labels. Even more worrying is that products labelled as “nicotine-free” hardly passed the test because two-thirds (6/9) were in fact found to contain it," the Quebec division of the Canadian Cancer Society said in a statement last fall. "In addition, a CCS-commissioned survey conducted by Leger Marketing on a sample of 2,000 respondents has established beyond doubt that the popularity of electronic cigarettes is soaring among youths. Nearly a quarter of 18-24 year olds have used electronic cigarettes during the course of the past year. A proportion as high as 60% of youths report having used them for fun or out of curiosity, with the desire to quit smoking coming far behind. "These figures explode the myth that electronic cigarettes are made for smoking cessation." Nationally, e-cigarettes come under the purview of Health Canada. In an email exchange with Yahoo Canada News, Gary Holub — a spokesperson for the government agency — reiterated that e-cigarette products, including e-liquids that contain any amount of nicotine or have a health claim, are indeed prohibited. "Currently, the advertisement and sale of electronic cigarette products, including e-liquid, that contain nicotine and/or have health claims is non-compliant with the Food and Drugs Act, and is therefore illegal," said Holub. "To date there is not sufficient evidence that the potential benefits of e-cigarettes in helping Canadians to quit smoking outweigh the potential risks. A company would have to provide evidence of safety, quality and effectiveness in order to have its product authorized. Without this scientific evidence, Health Canada continues to advise Canadians, especially youth, against the use of these products." While they might be illegal and while they might be advising youth against the use of them, the warnings aren't working. E-cigarettes and their liquids — even with nicotine — are readily available online and in stores throughout the country. Meanwhile, other jurisdictions are acting. CTV News notes that Red Deer, Alberta implemented a ban in June while the government of Nova Scotia intends to table e-cigarette legislation this fall. And, in the United States, vaping is banned in public places in New York city, Los Angeles, Boston and Chicago. Internationally, according to a report referenced by CBC News, the sale of e-cigarettes is prohibited in Australia, Brazil, Mexico, Panama, Singapore and Switzerland. Finally, on Monday, the American Heart Association released a policy statement calling for a ban on e-cigarettes for minors and stricter laws on their marketing and advertising. "While electronic cigarettes do not contain many of the harmful chemicals generated by conventional cigarettes, it is unclear whether electronic cigarettes are safe especially with respect cardiovascular toxicity," AHA President Dr. Elliot An.man said in a video statement. "Therefore the American Heart Association advises non-Tobacco users not to try electronic cigarettes." While others move forward, the Ontario and federal governments say that they will continue to study the situation. According to Global News, the province has asked has asked the Harper government to take a "more active role in regulating e-cigarettes" while the Feds say that they're monitoring the situation. "On an ongoing basis, Health Canada reviews scientific studies and literature, health and safety data at home and internationally with regard to electronic cigarettes and other nicotine containing products," Holub said. "We are monitoring the actions of regulators in other jurisdictions, and considering all options for appropriate oversight of these products, to protect the health and safety of Canadians."